Listening is an important part of communication but is also one of life’s most difficult skills. When someone is speaking to us, there is a delay between what we hear and what we understand. During this time, we begin listening to our own internal conversation and as a result, our ability to comprehend what the speaker is saying declines. This lag time can be a result of our physical or emotional state but odds are, it is due to our own thoughts and opinions that we seek out of every conversation to support our own personal beliefs. Called confirmation bias, this tendency causes us to only listen for what we want to hear. Often, people also employ competitive listening in which they hear something they believe to be false. This causes a negative reaction, listening ceases and communication breaks down. Listening requires dedicated concentration and a willingness to understand what the other person is saying. To achieve understanding, we have to listen to comprehend rather than listening only with the goal to reply. Understanding does not necessarily mean we have to agree but when we are able to recognize and appreciate another viewpoint, communication flourishes. 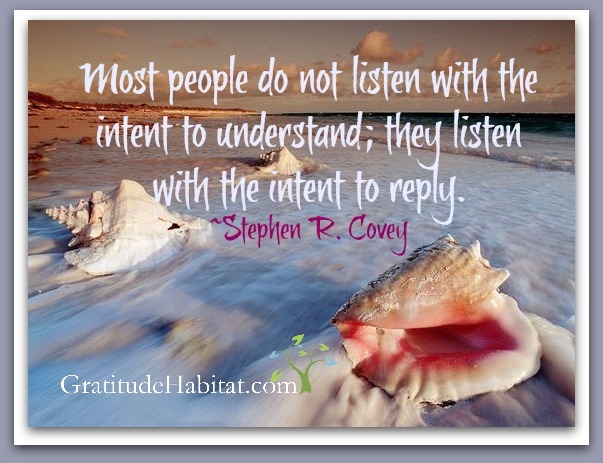 Below are 7 tips on how to listen to understand rather than listening to reply. Turn off phones, televisions, shut the door. Do whatever is needed in your current environment to limit outside distractions. Take a deep breath and relax. Make yourself comfortable. If you’ve been caught in a place where you are unable to listen without distractions or an important topic comes up during another conversation, set a future date to discuss that topic. Listen. Avoid judgment or forming replies. To help focus, repeat in your mind what the person has said. Focus on the overall topic of what the speaker is trying to convey. What is the big picture, the overall purpose or point? Avoid dwelling on the details, which can automatically put you in a place of competitive listening. Focus on the substance not the specifics. In addition to listening to a speaker’s words, ‘listen’ to other forms of communication. The tone of their voice, their body language, eye contact, the speed of their speech. This will give you a deeper insight into the big picture. It is acceptable to politely ask the speaker to repeat or clarify something, but only in between sentences. Other than this request, do not interrupt them or come to any conclusions before they’ve finished talking. Then, take a moment and reflect upon what you’ve just heard before speaking yourself. This demonstrates that you’ve heard what the speaker had communicated and understand what they’ve said. It also allows them to clarify any points you may have inadvertently misconstrued. It is helpful to speak from their point of view and keep emotions at bay. If you discover that you disagree with the speaker, ask yourself a few questions to help put yourself in their shoes so you can better understand their viewpoint. “Why might their message be true?” “Under what circumstances could it be true?” You can ask them clarifying questions but be sure they are not confrontational. These seven steps can help us better communication and appreciate what other are saying. May your day be filled with gratitude and good things.